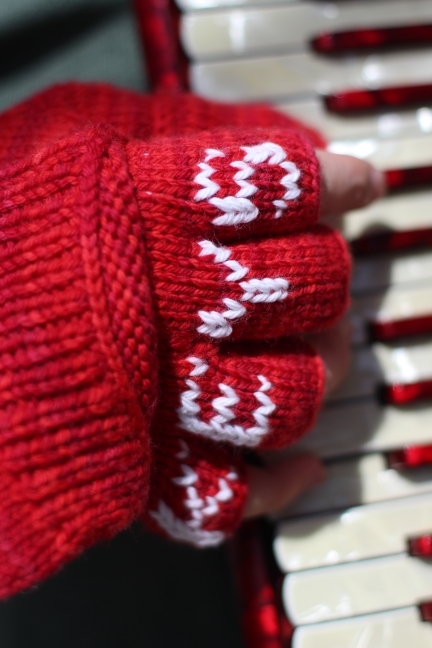 Over the summer, Evelyn asked me to knit her some new mittens. When we were on vacation, we stopped into My Sister Knits in Fort Collins, and Evelyn picked out some super pretty (and super on sale!) yarn. Our original plan was to put flip-over mitten hoods on them like my gloves, but they came out really nice. Evelyn was so happy with them, she decided to keep them as-is so she could wear them inside! It’s been a while since I’ve had a knitting project, and it was nice getting back into it. It is certainly is much nicer to make things for people when they really like them! We started out on Christmas Eve with the play at church. Evelyn and Oliver are both in the choir, Oliver was set to be a lamb, and Evelyn was set to be Mary. What we did not expect was that Alex got conscripted to be baby Jesus (which means Sara was conscripted to play the “Innkeeper’s Wife” and help on stage). Alex is a little big to play a newborn,but was absolutely slaying the audience with his toddling around, saying, “ma ma” and playing with the hay. It didn’t hurt that Evelyn is his actual big sis, so was much more comfortable around him than the typical Mary. In fact, Alex hated the hats so much, that after that he refused to open any more presents. He reached in, felt the tissue paper, pulled his hand back like he got burned and then just shook his head “No!” We had to open them and show him they were not hats before he would accept any gifts. “It’s like Gift of the Magi!” shouted Evelyn. I thought it was such a unique gift! I didn’t even mean to get a hand-crank one, but when I saw it I thought she would like that one better! I’m talking about Ollie’s fitbit. Naturally, Evelyn responded in the way any big sister would: by pacing up and down the hallway behind him, making sure he doesn’t get more steps than her. Just the two of them doing loops, all day long. Luckily it was like 60 degrees for no reason, so we did get them out of the house for a bit, and Oliver managed > 20k steps for the day (and that was with going to see a movie!). Better that than another hand-crank coffee grinder I guess. 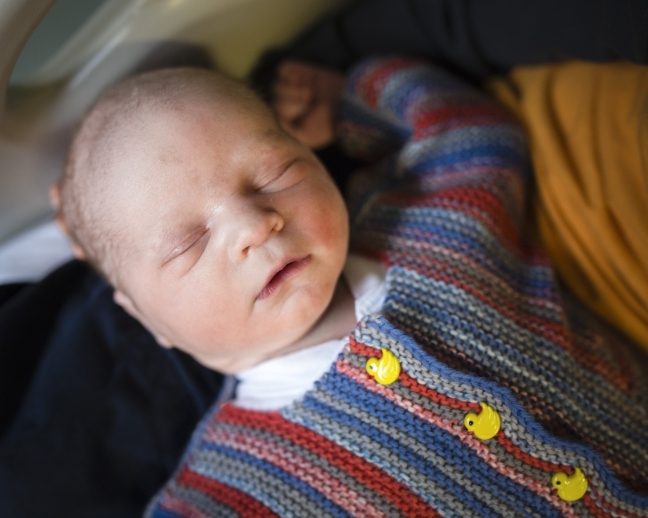 So…I started this post 3 months ago, with the idea of showcasing the baby things we knitted in preparation of Alex’s arrival. Somehow I only managed to do a post about the sweater *I* knit, but never quite highlighted all of the things that Sara knit. Many of these things have shown up in pictures already, such as the outfit Alex wore home from the hospital, and others have not, even though Alex wears them quite frequently. The blanket is certainly the highlight, in my opinion. It is one of the most beautiful and unique blankets I have ever seen, and if anything, it looks better in person. Definitely a great keepsake, as baby blankets should be. Sorry it took me so long to get this one up! Better late than never! I have knit my very first sweater! That’s right, I knit a huge, dinosaur-sized sweater! Alright, alright, so it’s a baby sweater. But still, a sweater’s a sweater, right? I think my knitting has improved at some point without me realizing, because this was actually pretty easy. Plus, it gave me something to do every day on the train. That’s right, I was that guy (hey, it was less weird than the lock!) I was a little nervous about finishing this in time, but it turns out I needn’t have worried. I will certainly add an “in-use” picture when applicable! 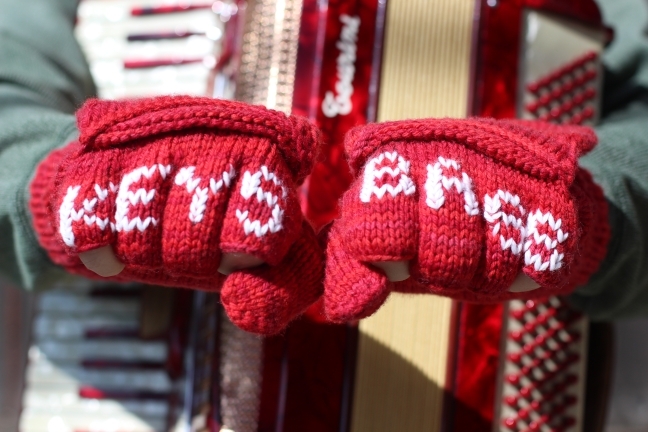 Guess who’s got himself a pair of badass accordion gloves? No, I needed something of my own. And hey, if you’re going to go custom, go all the way custom, am I right? So I made myself some “convertible” gloves, that can transform from fingerless gloves into mittens with the flip of a flap. There are even little flaps for the thumbs! As I was picking out the pattern for the gloves, I saw some with embroidery on the knuckles, and I knew I wanted to do that. But what message to put? Something badass, something awesome, something uniquely me, and something no one else would ever have in a million years. 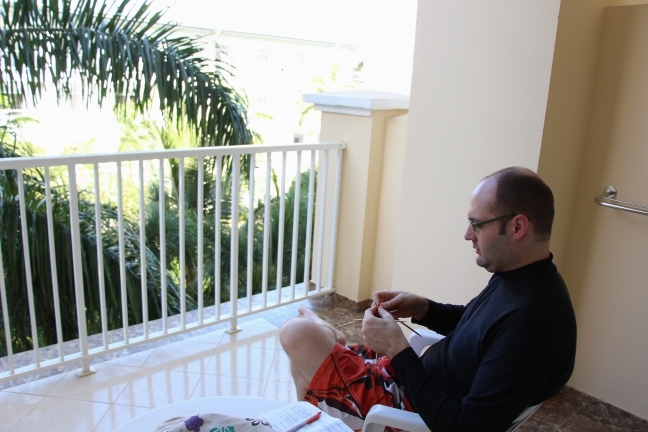 Look, I’ve even got a picture of me working on my mittens in Costa Rica. Mittens! In Costa Rica! 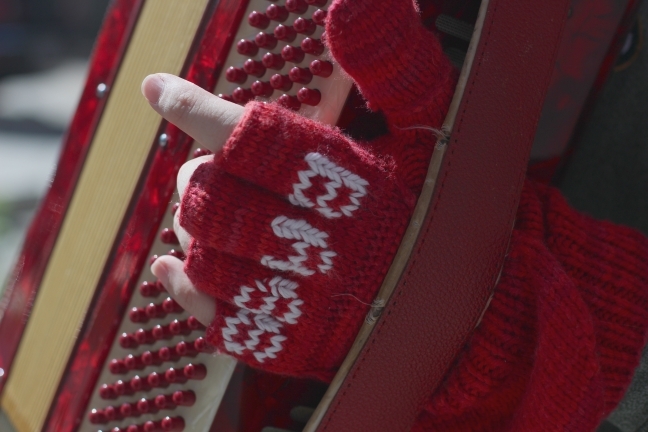 Now, I will admit, knitting these mittens has taken all the time that I would normally use to practice the accordion. But, hey! Now that I have the accoutrements, fame and fortune can’t be far behind, can they? 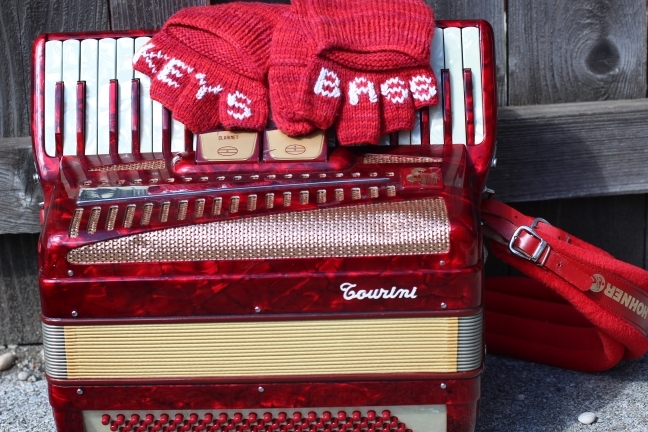 If nothing else, at least I’m prepared for some winter busking. 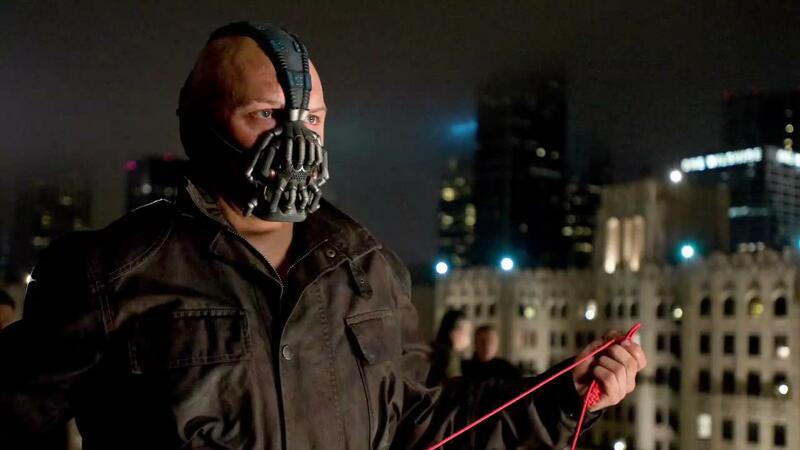 From the truly surreal files, you remember the Batman villain Bane? This guy? You notice anything strange in his hand there? Turns out that our buddy Bane is a fan of the fiber arts. …it seems pretty out of place for someone set on destroying a city to all of a sudden have a penchant for arts and crafts. “Eh well! How then?” demanded madame, tying another knot, as if there were another enemy strangled.